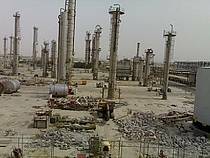 The 20,000 bpd Oil Refinery, designed for high conversion and production of low sulfur products by hydrocracking, was dismantled between 2007 and 2010 and is available for immediate transportation. Built by UOP/Chyoda in 1974 at 20,000 bpd, the refinery was shut down and mothballed in 1998, being in excellent operational condition. The oil refinery was originally designed to process heavy crude oil and was later modified to handle Arab Light. A study has been carried out to increase capacity to 27,000 bpd and 46,000 bpd.